Furnish the skills of fresher/Experienced at corporate by delivering industry admirable certification for Microsoft Power BI training. Complete practical training by expert & professional Sr. Business Analyst With having 10+ Years of experience. Experience unique and lively – Real time projects learning & case study for learners at SLA’s workshop. Complete assistance for fresh batch schedule/re-scheduling classes/arrange doubt classes to the Learners. When it comes to Data Visualization and reporting, Microsoft Excel has been the first choice for Business organizations all over the world, however, Microsoft Power BI, in the past few years, seems to have turned out to become one of the most powerful Analytical and Business reporting tool with faster Analytical and Statistical functions with visualization across wider Data Sets and also has the ability to provide answers in real time through Rapid recombination of fields. Microsoft Power BI delivers for better insights than any other Data Visualization tools and today it is extensively utilized by Business organizations all over the world for the purpose of retrieving information from various systems in the cloud and on-premises and develop dashboards in order to track the metrics. After acquiring skills in Microsoft Power BI, you will be able to choose a wide range of career choices in the fields of Business Intelligence, Data Warehousing and Data Analysis. In recent times, Microsoft Power BI has achieved immense success and exposure and professionals with Power BI skills have better job prospects than others and when it comes to Data Visualization and Business Intelligence, this is specialized tool seems to be leading the way. Therefore, if you also want to pursue a career in the Data Analytics and Data Visualization free, then Learning Microsoft Power BI would be the most remarkable step for your career. There are various Microsoft Power BI Training Institutes in Gurgaon, however, SLA Consultant Gurgaon is known to be the most reliable and worthy MS Power BI Training Institute as they have been providing job oriented and industry focused Training in Data Analytics to the participants for the last 10 years successfully. 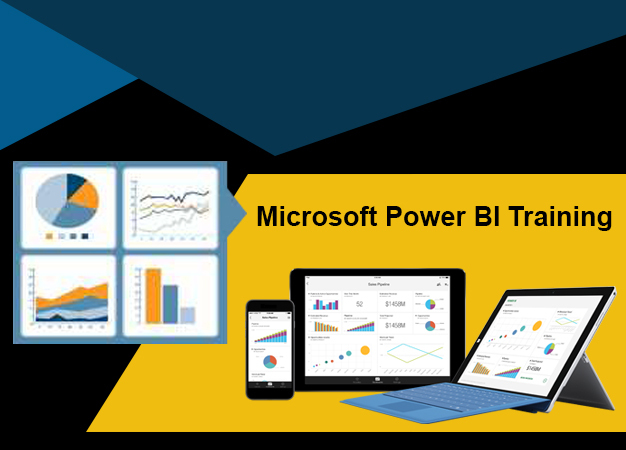 The Microsoft Power BI Training Course Gurgaon is designed specifically by industry experts while keeping in mind the current Business requirements and is targeted towards both beginners and working professionals having interest and will in working with numbers and figures. There are no special criteria to attend the MS Power BI Training Course Gurgaon as long as the candidate have a graduation degree in any field, particularly in IT field. The MS Certification Program will cover all the important aspects of Microsoft Power BI tool which include data modelling in MS Power BI, Data Visualisation, Data Exploring and sharing, Data Analysis expression application and much more. After completing the MS Power BI Training, you will successfully be able to play the role of lead Business Intelligence Analyst for any Business organisation and fulfill the job requirements easily. The students with no technical background can also attend the Microsoft Power BI Training and become a professional Data Analyst within a short span of time through this rigorous MS Power Business IntelligenceTraining Course which can be completed within 20 hours. The content of the MS Power BI Certification Course is highly updated and provides the participant with real time and Real world understanding of Data Visualization and reporting using MS Power BI to fulfill the requirements of the Business organization. And hence, if you want to kick start your career in the Data Analytics feeling, then you can attend high quality Microsoft Power BI Training Course Gurgaon from SLA consultants Gurgaon as early as possible. The Microsoft Power BI refers to the set of tools which is extremely useful for Analyzing information and extract valuable Business insights on why developing interactive dashboards. With the help of MS Power BI Course Gurgaon, the participants will receive the best skill sets in Power BI enabling them to resolve Business issues and improve their performance and Business operations. The MS Power BI Training will help the students grasp and master various skills such as the development of dashboard, publishing reports, identifying insights from the information using quick Insight, performing Data Analysis and Data Visualization and troubleshooting different issues in the tool. MS Power BI Training is conducted by well qualified and certified trainers with over 10 to 15 years of experience in the field who will help the students learn to extract valuable information and Data Sets for multiple unrelated sources and transform it into simplified and coherent set of information which is visually appealing in the form of charts, graphs and reports which would allow the management to take better decisions. The intelligently designed MS Power BI Certification Course will offer in depth understanding of the tool and how it operates in different scenarios along with giving the participant with the ability to perform Data Visualization and Analysis and derive insights from local databases and Excel spreadsheets. Furthermore, they will be able to develop compelling reports, create and share Business information with the purpose of developing dashboards and much more. Once the student successfully complete the MS Power BI Training Course Gurgaon, he or she will have all the necessary expertise and skills to become a Business Intelligence professional which include creating and managing Data alerts, developing report layouts and Data Visualisation best practices, supervising the data analysis and visualisation project, improving the team collaboration with the Microsoft team, identifying and troubleshooting issues in the Power BI, etc. The instructors will provide Real time MS Power BI Practical Training to the participants using live projects and sentiments that would provide hands on experience and working knowledge of using Power BI in real world. Apart from that, our excellent administration support will help you at every stage of your MS Power BI Training, whether conducting backup classes for the students who are falling behind our helping them with their course fees. After 70% completion of the MS Power BI Training, all the participants will be provided with 100% Job Placement Support which includes conducting mock interviews and Personality Development training so that they do not find any difficulty clearing any interview related to Data Analytics in the future. They will also be sent to various reputed Business organizations where job interviews for Business Intelligence and Data Analytics job profiles are being conducted until they are selected. And valid certification in Microsoft Power BI will also be given to the students which will build their resume and enhance their visibility to the recruiter and make them stand out from the crowd. All these features and highlights make SLA Consultants Gurgaon the top priority for any individual who wants to pursue a career in Data Visualization and Data Modelling field. For more information related to a Microsoft BI Training Course Gurgaon or our MS Power BI Training Institute in Gurgaon, we request you to send us your query on our official website or visit our office in Gurgaon to consult our administration. MS Power BI is the product of Microsoft which is a fabulous Business Intelligence and Analytics tool which has already become the favourite Business Intelligence tool for various Business organizations all over the world. It is leading the way of Data Warehousing and Data Visualization and is considered as the top choice for the various forward-thinking company. The Microsoft Power BI is a tool which can be used for extracting information from various disparate sources and derive meaningful insights from it. There are various reasons why Power BI have become one of the most tremendous and useful tools in the current Business industry. It has an expendable and powerful dashboard visualization which is talking along with in-memory analytics feature that supports tabular data. Other of its major features include customizable visualization, connectors, cloud-based analytics platform that offers data sharing anywhere anytime, quick extraction of data, live connectivity to SQL and much more. Furthermore, it is also considered is the best option for cloud Business Intelligence and Analytics and various reports suggest that 71% of business enterprises are adopting cloud only analytics for which this tool will continue to play a very crucial role. Both small scale and large scale Enterprises seems to be loving with the power BI tool as it helps them to process and extract information faster and security. And the main reason why most of the IT student who wants to enter into the Business Analytics field are turning towards learning Microsoft Power BI as compared to Microsoft Excel and other Data Analytics tools. If you want to know why you should also learn Microsoft Power BI, then please refer to below mentioned points. Due to the increasing requirement of professional Business Analytics and Business Intelligence professionals in the market, acquiring skills in Microsoft power be considered as best option for college freshers and working professionals to lead a successful career in the future. Microsoft Power BI has a massive using community even though it is relatively new in the market. This means you can get your doubts cleared in real-time by asking the community your issues and sharing your opinion with like minded people. Acquiring skills in Microsoft Power BI will help you target various job profiles in the Business Intelligence field which include, Business Analyst, Business Development Manager, Data Analyst, Business Intelligence professional, Project Manager, etc. You will also not be restricted to any particular industry where you can get a job as business intelligence is useful in various fields such as marketing, sales and Finance, real estate, stock market, etc where you can get a job. Top business organizations and MNCs constantly seek professionals in Data Analytics and Business Analytics field which include Accenture, HCL, IBM, Infosys, Oracle, Google, etc. This means that you will not find any difficulty in your career and can also enjoy your growth opportunities. At last, one of the best reasons to learn Microsoft Power BI is the pay scale associated with it. In the international market, a Professional Business Intelligence Analyst can earn up to $90000 per annum. In the Indian market, you can easily earn up to 5 lakh to 8 lakh per annum as of 2018 after acquiring skills in Power BI. These are some of the most obvious reasons why you should consider attending high quality Microsoft Power BI Training in Gurgaon pursue a successful career in the Business Intelligence field. And therefore, we recommend you to visit our centre and attend our free demo class in order to get a better idea about our course curriculum and the qualifications of our teachers to make a better and informed decision. Find the Microsoft Power BI Course Duration Details below. How will the certificate from SLA Consultants Gurgaon in MS Power BI help me? In today’s highly competitive world, just having a graduation degree in Business Intelligence will not help you secure a high paying job in the market. Having certification from SLA consultants Gurgaon who is the very prominent and accredited training institute in Microsoft power bi, you will be considered to be a certified professional and treated like one during the interview giving you high chances of acceptance over others. Is it possible for me to cancel my enrollment? If I do can, I get a refund? Yes, the candidates can cancel the registration if they do not like the MS Power BI Certification Course for which they will receive complaint refund after deducting a service fee. However, we guarantee you that you will not be disappointed from the course at any level. Who will be the trainers for the Microsoft Power BI training course? The trainers are highly qualified professional having over 10 to 15 years of experience in the relevant field. They will provide you with MS Power BI Practical Training and conduct lectures and seminars to give you better idea and skills related to the tool. What kind of placement support you will provide during and after the training? We deliver job placement support which includes interview preparation and Personality Development training that prepares the student for any job interview that comes in his or her. Furthermore, we also send the student to various organizations for job interviews until they are selected. To whom should I contact if I have any queries regarding the MS Power BI course? We encourage the candidate to submit your quotations on our official website or give us a call at any of these numbers to solve their queries, +919999491958, +917836023222, +919999491895. It is also recommended to visit our official centre in Gurgaon. How can I make the payment for the program? The student can make payment in cash, debit and credit card, net banking and e-wallets. We also provide installment facilities to the students.